This is a ridiculously easy skill to acquire, it just requires a wary eye and a little bit of patience. I don’t know if you guys have noticed this yet, but I am a firm believer in kitchen skills. I feel like there are a lot of really basic things that a majority of the people I know have no idea how to do. I’m also a great lover of science, and I love using science to increase the productivity of many of my kitchen staples. In light of this I thought I would share a slightly less utilized skill in my arsenal: clarifying butter. Put all of your butter into your sauce pan and melt. Allow to simmer lightly for several minutes, skimming the foam off the top as you do so. Be careful not to allow your butter to brown, otherwise you will get a completely different flavor profile. The butter will then separate and you can strain your golden liquid from the heavier milk solids on the bottom of the pot using cheese cloth or just pour it off into a container as I did. You will end up with about 75% of the volume that you started with because some will boil out and the rest is the milk protein that you don’t want, so don’t be surprised when it looks like a lot less than you started with. Ewww milk solids. 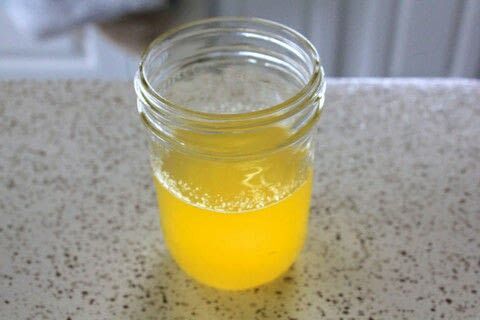 Achievement Unlocked: Clarified Butter! You can store this in a container with a lid in your fridge for up to one month.